The role legislatures play in the public policy-making process is of central concern to political scientists. Conventional wisdom claims that all legislatures except perhaps the US Congress are either marginal to the policy-making process or becoming increasingly so. In Legislatures in the Policy Process leading specialists in comparative government reassess this view and significantly advance research on the influence of legislatures. 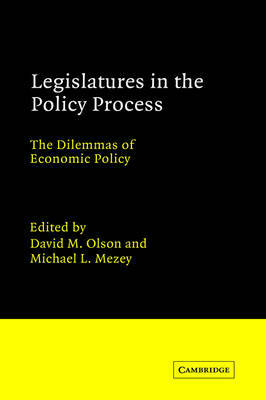 In the opening chapter, David Olson and Michael Mezey identify three categories of variables - external influences, internal influences and policy attributes - which can affect the policy-making role of legislatures. They specify sixteen hypotheses that describe the relationship between these variables and the policy participation of legislatures. In subsequent chapters, these hypotheses are examined through a series of individual and comparative country studies which focus upon the role of the legislatures in various aspects of economic policy making. These include the influence of the French, German, British and US legislatures on monetary policy; the role of the Brazilian Congress and Indian Parliament in computer and electronics policy and the part played by the Polish Sejm in labour policy.